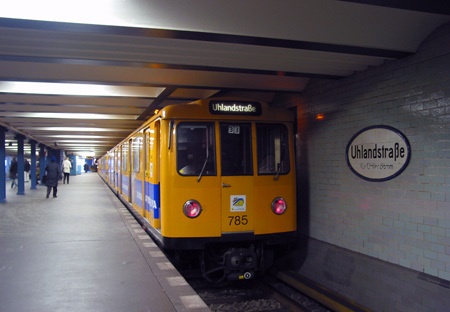 UrbanRail.Net > U-Bahn Berlin > Line U1 - Uhlandstr. - Warschauer Str. Small-profile line with ~105 m long platforms (mostly 8-car trains of A3 stock in service). 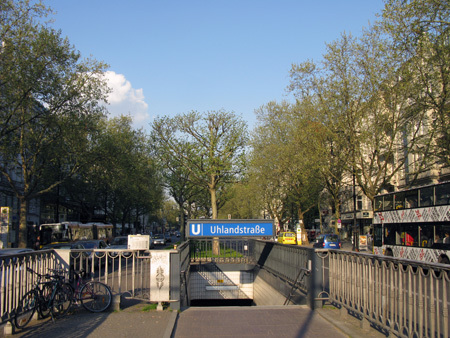 Line U1 starts underground at Uhlandstraße below Berlin's famous Kurfürstendamm. 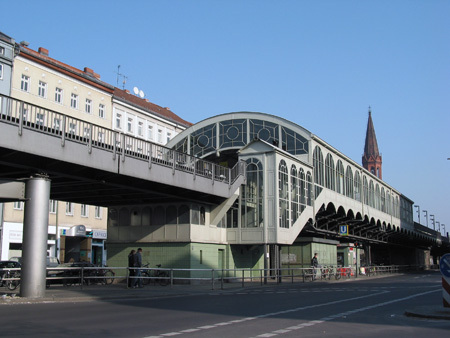 While the section to Wittenbergplatz hat already been opened in 1913, an additional station was added in 1961 to provide transfer to the new north-south line U9. 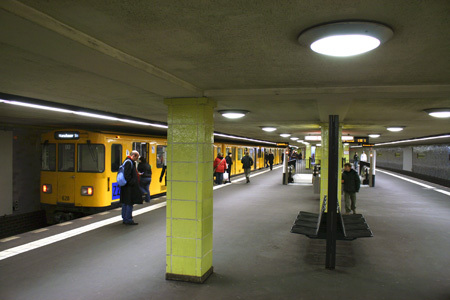 At Nollendorfplatz, line U1 shares the 4-track underground station with lines U3 and U4 (between Wittenbergplatz and Nollendorfplatz, lines U1 and U3 share tracks). 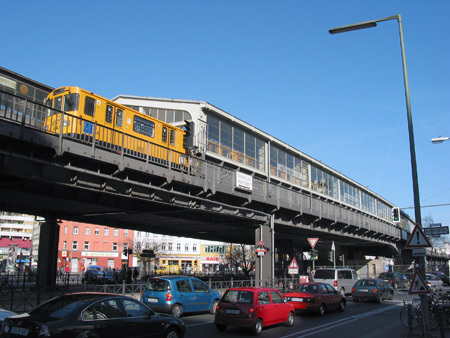 Between Nollendorfplatz and Gleisdreieck (upper level), line U1 runs along the so-called 'relief route' opened in 1926 to allow a direct line from Kreuzberg towards Wittenbergplatz, after the triangular junction at Gleisdreieck had been rebuilt into a two-level crossing in 1912. 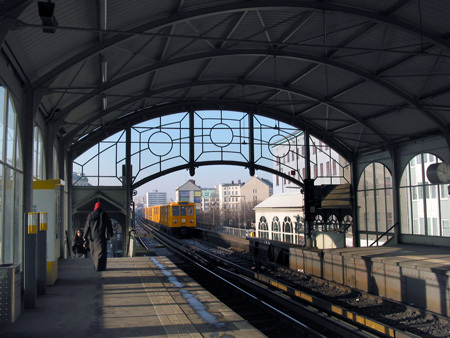 From Gleisdreieck to Warschauer Straße, line U1 uses the elevated route as opened in 1902, Berlin's oldest metro line. 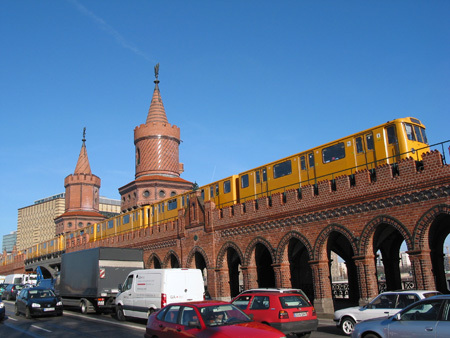 Due to the erection of the Berlin Wall, the line was curtailed at Schlesisches Tor between 1961 and 1995. 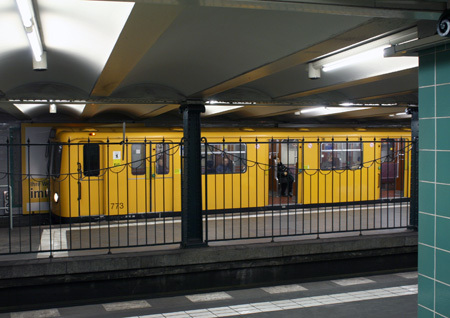 Between 1993 and 2004, the line number 'U1' was used for services running from Schlesisches Tor (from 1995 Warschauer Straße) to Krumme Lanke, while the branch to Uhlandstraße was served by line 'U15', sharing tracks with line 'U1' between Wittenbergplatz and Schlesisches Tor (from 1995 Warschauer Straße). 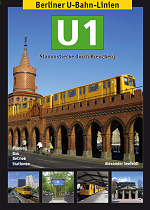 Berliner U-Bahn-Linien: U1 - Stammstrecke durch Kreuzberg. 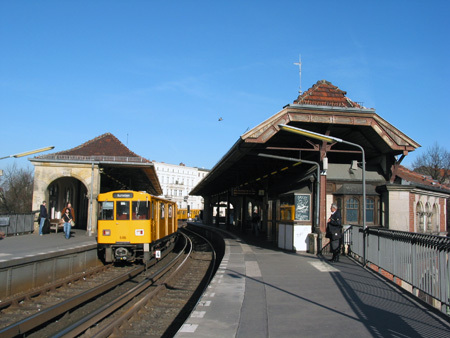 Station with side platforms; added in 1961 to provide transfer to the new north-south line U9. 5-track junction, with line U1 sharing the westbound northernmost track with line U3, and stopping at the southernmost track in the eastbound direction. 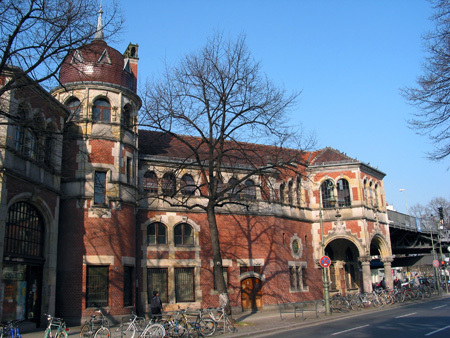 Station with a rather large entrance building from 1913. 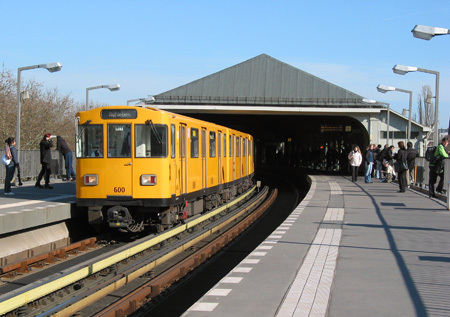 4-track double-deck underground station, with line U1 stopping on the northern side of the respective island platforms, eastbound on the upper level (track shared with line U3), and westbound on the lower. 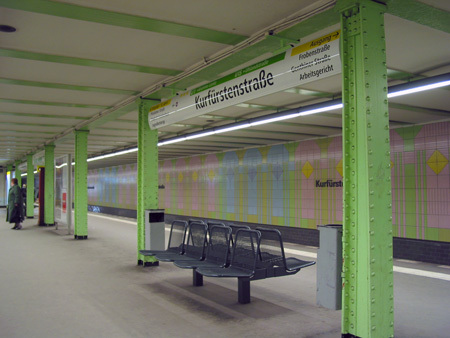 To the east of Kurfürstenstraße station, line U1 emerges from the tunnel on an elevated enclosed structure, and then continues elevated to its terminus. 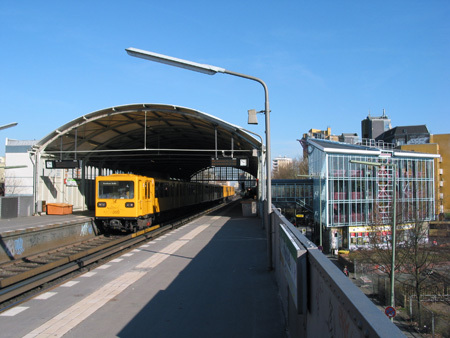 2-level station added on the site of the original triangular junction, with line U1 stopping on the upper level. 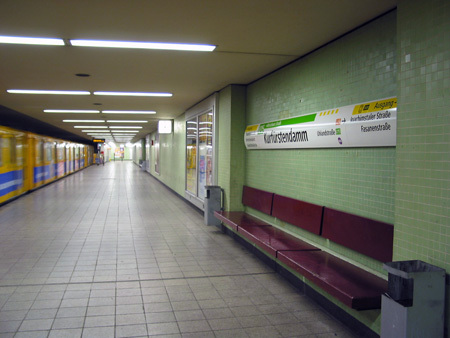 side platforms; station separated from line U7 by the Landwehrkanal, transfer is via a enclosed bridge. 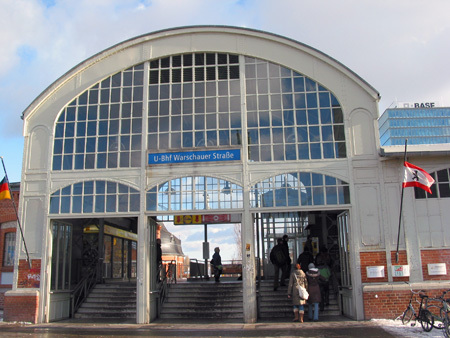 side platforms; entrance building on the southern side added in 1991. 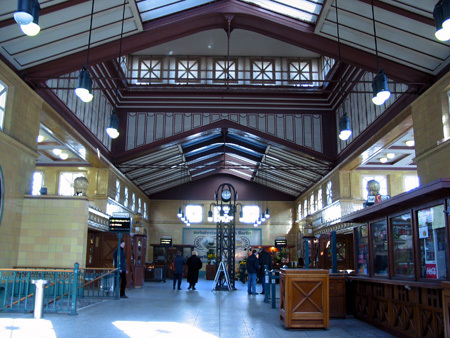 Originally located slightly further east with typical side platforms. Relocated to its present location with an island platform to provide convenient interchange with line U8. 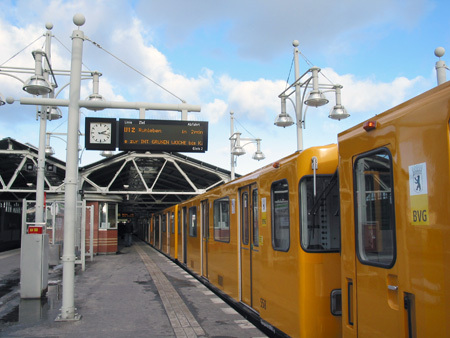 side platforms; preserved mostly in its original form. side platforms; entrance and platform side walls made of bricks. 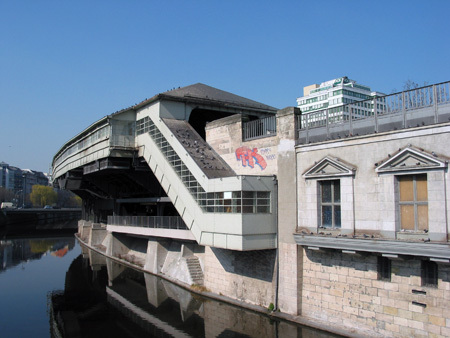 From 1902 until World War II there was another station between Schlesisches Tor and Warschauer Straße, called Stralauer Thor (later Osthafen) and located on the right bank of the river. 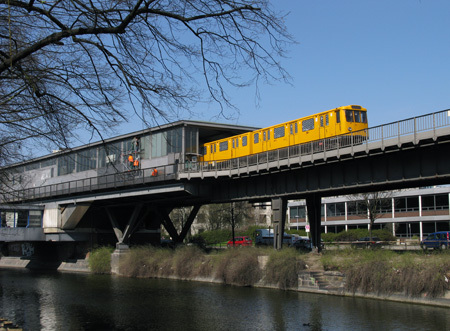 Between 1961 and 1995, out of service due to Berlin Wall running along the Spree River in this area. 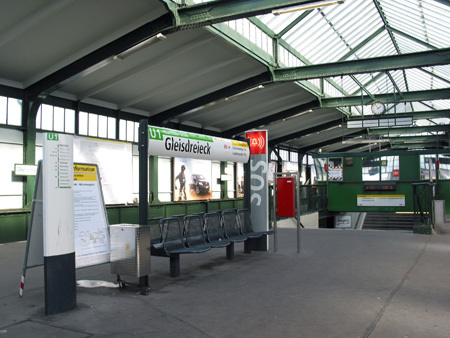 Station may be relocated further east to provide improved transfer to the S-Bahn.